Clothing and shoes has now become more than just a necessity. Having two or three pair of clothes will not be sufficient, not even for the extreme lower class of our society. The desire for more clothes, colors and designs is ever increasing and people have been finding their ways around to fulfill them. Locally manufactured unbranded clothes, shoes and bags are low cost but, understandably, the quality isn’t great. With just one or two wash, the fabric loses its appeal and in some worse cases starts to lose the shape as well. The issue was solved for a lot of people when ‘Goras’ as we call them, started sending their branded but used belongings to the country and people started selling them in extremely low rates. The places where this stock was traded came to be known as the ‘Lunda Bazaar’. It all depended on people’s luck what piece they got their hands on because sometimes the item was as good as brand new. The interest in this ‘lunda’ shopping spread like forest fire and soon the middle class and even some from the upper middle class started purchasing. They thought that paying 10 times the price to get the same original brand was not justified when the exact same item, though in a slightly old look, could be bought in far less price. Karachi became the hub for these used items and it included clothes, shoes, bags and many other items like jewellery, crockery and plenty of home essentials. There was, however, one problem which remained for people was physically going to the places. These ‘bazaars’ were usually at the suburbs of the city and that too only in selected cities. This is when the concept of online stores came into the minds of two people; Usman and Fareed. These two were friends and certified accountants who came up with this idea and launched khazanay.pk, as an online website. They first visited the light house market in Karachi, where all these parcels arrived and then from there they were distributed in other parts of the country. By several visits they realized that this was not a small market and that the demand for these used products was massive. It only seemed viable to provide people with the facility to access these items sitting at home and get it delivered to their doorsteps. Initially they invested about 1.5 million PKR in buying that inventory and within few months the orders started coming. The pace of the orders went to about 20-40 orders everyday and this meant about half a million turnover for every month. The products have been categorized because not all products are of the same quality. There is excellent condition, relatively used and average; the cost differs as per the quality. Kumcost.pk is another similar website which deals in the trading of used items. 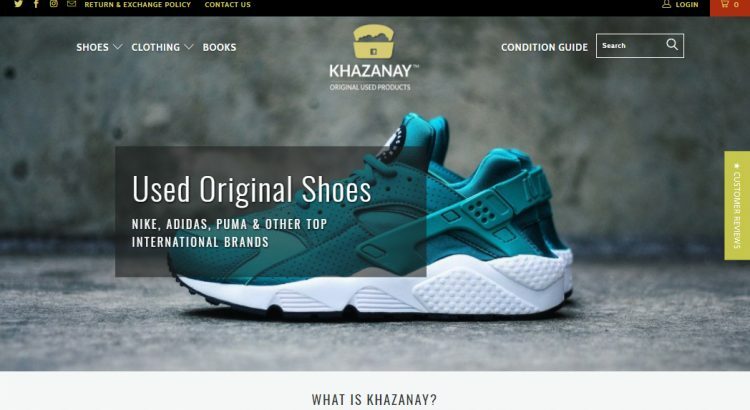 These two websites show that the trend of this type of shopping is increasing and people are moving towards more reliable and sophisticated channels of purchasing these items. The response in the coming few years will set the course for it further ahead; right now which seems pretty positive.